I have come to Walden in many seasons. My last visit occurred on a brisk autumn day, when I discovered some locals swimming in the pond. Dipping my toe in the water, I was surprised how well kettle ponds hold their heat, even at such a late date. Not all bodies do so. Like many Americans, my first exposure to Thoreau occurred in high school. My language arts textbook excerpted the famous passages from Walden, or Life in the Woods: those lines about simplifying, hearing a different drummer, advancing in the direction of one’s dreams. At the same time, I was immersing myself in all kinds of adolescent ego literature, that favored genre among young white American males who fancy themselves exceptional, independent and worthy of independence. Among the canonical texts were William Ernest Henley’s poem “Invictus,” Ayn Rand novels and a handful of Ralph Waldo Emerson’s essays. This literature can encourage hesitant but promising young people to follow their individual visions. But it also can stunt growth. The flimsiest volumes in the genre rarely discuss the process of self-cultivation (what it takes to nurture a self worth relying upon) or how to balance individualism with piety (how to rightly relate one’s individual visions to the sources of their being). Were one to judge by his deployment in school textbooks, or on motivational posters and internet memes, Thoreau’s work would seem just this flimsy—and for that reason harmful. The United States has more than our share of stentorian, self-proclaimed self-reliers—career individualists who produce little but platitudinous talk about individualism. Out of their mouths, the rhetoric of nonconformity and self-reliance licenses gross inattention to history, to the environment, even to the selves on which they claim to rely. If such people read, it is not surprising to find adolescent ego literature functioning for them as devotional literature well into what is called their adulthood. If Thoreau’s words merely decorate the playrooms of grown children, his burial is long overdue. If Thoreau’s words merely decorate the playrooms of grown children, his burial is long overdue. But laboring with Thoreau requires turning all of the leaves—not simply the plucked quotations, not simply Walden. While Walden gives us plenty to discuss as a self-contained work, it is important to remember that Thoreau was seeking to live a fully integrated life. Every part was to inform and complement the others. Not all that transpired during Thoreau’s residence at the pond—Walden the Experiment—appeared in Walden. During Walden the Experiment, for example, Thoreau completed A Week on the Concord and Merrimack Rivers, was jailed for refusing to pay his poll tax and took one of his long excursions to Maine. In the seven years between the conclusion of Walden the Experiment and Walden’s publication, Thoreau visited Cape Cod and lectured regularly. Through it all, he kept his journal, which functioned as a site to test undeveloped ideas but also possessed some of the same extravagant conceits one finds in his published works. Thoreau was always experimenting in partial view of his neighbors. Where did any of his experiments begin or end? How much was contained and released at Walden, or in Walden? Thoreau is turning 200. I am approaching 40. I cannot tell how old my country is, or if it is maturing. I am thinking about Walden, or Life in the Woods, and I am thinking about Walden the Experiment. I am turning new leaves—not so much abandoning Thoreau’s great literary work as surveying Walden’s broader topography, in search of all arable tracts. Read alongside one another, Thoreau’s works disclose aspects of his methods and aspirations that are often latent in any solitary work. So examined, his enterprise does not reduce to juvenile navel-gazing. Thoreau’s full experiment is a record of self-reliance coupled with piety. The man is concerned with the labor required of and on a self: an individual working out—and out of—his connections to people, places and processes. It is not precisely solitary work. Were Thoreau a simple idolater of his own vision—in Emersonian language, a “mean egotist”—episodes of disorientation would not be so central to his reports. 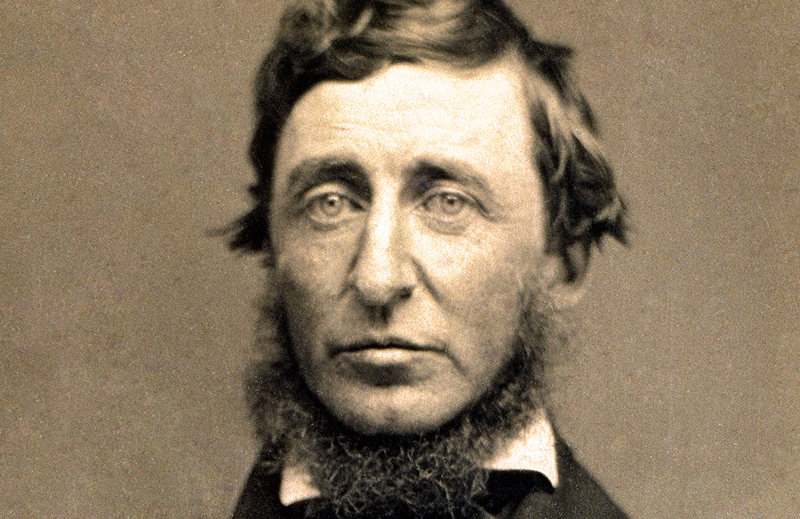 For example, Thoreau’s Cape Cod essays are filled with miscalculations. Shipwrecks are everywhere. Thoreau and his friend Ellery Channing find themselves mistaken for two robbers who are wandering the peninsula, and Thoreau constantly must render an account of his true identity, never certain if the account will land. Thoreau the surveyor has difficulty calibrating distances on the continent’s edge; the ocean, the sand and the lights refract each other in unpredictable ways. The light-house lamps a few feet distant shone full into my chamber, and made it as bright as day, so I knew exactly how the Highland Light bore all that night, and I was in no danger of being wrecked. Unlike the last, half awake and half asleep, looking upward through the window at the lights above my head, how many sleepless eyes from far out on the Ocean stream—mariners of all nations spinning their yarns through the various watches of the night—directed toward my couch. Thoreau seems not merely untroubled but grateful for the “daying” of his night. The ordinary moment upended by tricks of light holds the promise of revelation for those willing to receive it. The individual who tells us in Walden, “morning is when I am awake and there is dawn in me,” seems so inclined, at any hour. While Thoreau is confident in Cape Cod, maybe even cocky at times, his is the confidence of non-attachment—the sort that permits his vision to be adjusted and corrected. But this is not entirely an individual’s hour. Thoreau’s Cape Cod revelation involves other people. Thoreau has described the lighthouse keeper’s duties in the preceding paragraphs; we know that another man illumines Thoreau’s private chamber. The keeper’s light casts itself toward Thoreau and a broad swath of humanity at sea, whom Thoreau does not so much see as sense by meditating on the lights above. Calling attention to their duty as watchers of the night, Thoreau implicitly links the mariners to the prophetic “watchmen” of Hebrew scripture: Isaiah, Jeremiah and Ezekiel. The Thoreau of Walden is certainly attempting to enact a prophetic vocation: to be fully wakeful, to “wake his neighbors.” But on this night in Cape Cod, it is others who are sleepless. The mariners outpace and elude Thoreau, the would-be prophet who tells us that, of late, he has been but half awake. Thoreau does not completely cede his own prophetic calling to these fully awake watchers. He remains somewhat full of himself. But Thoreau is working out his calling in light of others’. The watchmen bear witness to his place of repose, calling him to task. I stand in awe of my body, this matter to which I am bound has become so strange to me. I fear not spirits, ghosts, of which I am one...but I fear bodies, I tremble to meet them. What is this Titan that has possession of me? Talk of mysteries!—Think of our life in nature,—daily to be shown matter, to come in contact with it,—rocks, trees, wind on our cheeks! the solid earth! the actual world! the common sense! Contact! Contact! Who are we? where are we? As on the Cape, Thoreau is a bit full of himself: Who else in Scripture encountered some power on a mountain whose presence he could hardly bear? But unlike his approximate peer Walt Whitman, who tends toward moral satisfaction and personal delight when he is overwhelmed by measureless creation, Thoreau seems unsettled. Spiritual heir to the Mid-Atlantic Quakers, Whitman believes in the goodness of all creation, which softens the blow of apparent dissonance in such moments. Whitman is frequently awed; he is rarely mortified. Thoreau’s immediate spiritual ancestors are New England Puritans; creation might be good at its root, but the dissonance is substantial. Ascending Katahdin, Thoreau experiences every substance, even his own body, as a vast enigma. He verges on terror. “Who are we? where are we?” This does not sound like a man who has a sentimental, simplistic view of the self. Subjects and objects converge as Thoreau, possessed by “this Titan,” feels himself being absorbed in and by the material mystery of the universe. First-person pronouns become pluralized; this is not one man’s absorption. At the same time, Thoreau discloses at least a felt otherness, a distance between subjects and objects, that persists even in their convergence. Thoreau is capable of feeling spiritual connections with nature, but here his relation to the world as flesh—“the solid earth! the actual world!”—proves harrowing, barely untranslatable. Incarnation is mystery. “Contact! Contact!”—maybe a celebration, a lamentation, a command, a distress signal, or some unaccountable combination. In any case, Thoreauvian self-examination is a reckoning with the earth, with touching bodies. This season I visited Walden again. Standing several feet away from the replica cabin, the bronze Thoreau is staring at his left hand, walking away from his abode. Thoreau’s final experimental act here was departure. He hypothesized in Walden that he could hold the heat of his pondside dwelling even after he released himself from it. He could hold the heat because of what he had kindled there and what he had disciplined himself to absorb—in solitude, not in isolation, independence along with piety. The same man tells us in Cape Cod, “when your lamp is ready to give light, it is readiest to receive it.” Two hundred years after Thoreau’s birth, I realize that Walden amounts to more than a private Life in the Woods. In 2017, I hear Thoreau calling us to an individualism more connected in its solitude, more attentive to its sources. It is ours to take up the labor, to put away the childish things. "It brackets together indiscriminately such mixed items as ideas, customs, beliefs, traditions, fancies, fashions, art-forms and art-works, tricks of the trade, opinions, doctrines, theories, images, concepts, attitudes, practices and habits. When we are actually trying to study culture, it is not helpful to blur these differences so grossly." Apart from it's dubious scientific value, it is almost useless in everyday conversation let alone scholarly writing. At best it's a useful substitute when good vocabulary escapes us. But, I think 'whatchamacallit' is better since it also acknowledges the mental lapse. But, also since it appears to spring from a view of reality that is best described as scientism, I find it quite odd in a Christian publication. This article also appeared in print, under the headline "Henry David Thoreau: a man of solitude seeking connection," in the August 7, 2017 issue. Ryan Harper is a visiting assistant professor in New York University's Religious Studies Program. He is the author of The Gaithers and Southern Gospel: Homecoming in the Twenty-First Century.